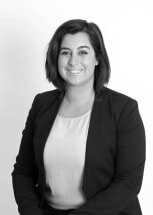 Samantha is an associate attorney of the law offices of Maho & Prentice, LLP. She practices civil litigation with an emphasis on representing plaintiffs in personal injury, premises liability, product liability, wrongful death and serious and catastrophic injuries. Samantha represents clients across California, including Santa Barbara County, the Santa Ynez Valley, Los Angeles and surrounding areas. While at UC Hastings College of Law, she was an associate development editor of Hastings Business Law Journal, and a member of La Raza Law Students Association. Samantha is currently an active member of Santa Barbara Women Lawyers. Prior to law school, she worked for two years as an in house staff accountant, following her graduation from the University of Southern California's Marshall School of Business and Leventhal School of Accounting. While not working, Samantha is an active supporter of youth sports, specifically Santa Barbara 805 Water Polo Club and Dos Pueblos Boys and Girls Water Polo.